Ina Road Animal Hospital is proud to serve Tucson, AZ and the surrounding areas. We are dedicated to providing the highest level of veterinary medicine along with friendly, compassionate service. We welcome all new clients to our veterinary facility. We invite you to contact us today. If you have any questions or concerns, please don't hesitate to call us at (520) 544-7700. At Ina Road Animal Hospital, we offer a variety of services to care for your pet. If you have any questions or would like more information on how we can care for your pet, please contact us today. Pet Emergency? Call us right away at 520-544-7700! If you live in Tucson or the surrounding area and need a trusted veterinarian to care for your pets – look no further. Your pets’ health and wellbeing are very important to us, and we take every possible measure to give your animals the care they deserve. 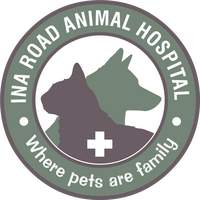 Ina Road Animal Hospital is a full-service animal hospital and welcomes both emergency treatment cases as well as pet patients in need of routine medical, surgical, and dental care. Ina Road Animal Hospital has years of experience treating serious conditions and offering regular pet wellness care. Beyond first-rate pet care, we make our clinic comfortable, kid-friendly, and calm, so your pet can relax in the waiting room and look forward to meeting our Tucson veterinarian. We are happy to offer a number of resources that enable you to learn about how to take better care of your pets. Please feel free to browse our site, particularly the informational articles. The best veterinary care for animals is ongoing nutrition and problem prevention, so becoming knowledgeable about preventative pet care is essential to the ongoing success of your animal’s health. If you have any questions, call 520-544-7700 or email us and we'll promptly get back to you. Our Tucson veterinarian office is very easy to get to -- just check out the map below! We also welcome you to subscribe to our newsletter, which is created especially for Tucson pet owners. At Ina Road Animal Hospital, we treat your pets like the valued family members they are. Dr. Brenda Reed grew up in Wyoming with dogs and cats and visiting the cattle and horses on her grandparent’s ranch. Currently she has three dogs: Riley, a neurotic Weimaraner; Randi, a hairy Golden Retriever and Skippy, a classic mutt. She has a special interest in using acupuncture and Chinese herbal therapy to treat pets. Often, she uses acupuncture to treat chronic pain conditions such as arthritis. The most fulfilling aspect of working with animals is being able to see their happy, smiling faces and working with their guardians to help them be well. (With IRAH since 2003). Dr. Devey was intrigued by veterinary medicine from a young age and enjoys all aspects of this profession, especially surgery. She is one of the doctors offering abdominal ultrasound at IRAH. She is the mother of two boys who also share her love of animals. Dr. Devey is pleased to be back in the Southwest after a five year absence. (With IRAH since 9/2007). Dr. Julie K. Johnston grew up in Michigan but has considered Arizona home since 2003. A former veterinary assistant at Ina Road Animal Hospital, Dr. Julie graduated from Michigan State University in 2015 and is now happily back at Ina Road. Dr. Julie and her wife have a big furry family filled with 4 dogs and 3 cats! Dr. Julie was certified in veterinary acupuncture through the Chi institute and is currently working on Chinese herbal certification. Her interests focus on pain management, geriatric, and feline medicine. She is a member of the American Association of Feline Professionals, American Academy of Veterinary Acupuncture and the American Association of Traditional Chinese Veterinary Medicine. Nothing makes Dr. Julie happier than to see an older dog or cat begin acting like a puppy or kitten again! Dr. Khalsa was born and raised in Tucson. She completed undergrad at the UofA in 2008 and completed her DVM at Ross University in 2012. Dr. Khalsa has volunteered at the Tucson Wildlife Center, and sterilization clinics abroad. Dr. Khalsa loves offering high quality health care for your furry family members. She enjoys discussing wellness care and surgery. Gurushabd enjoys playing soccer, hiking with her two rescue dogs Samurai a husky, and Reilly a boxer-pit mix, and cheering on the UofA Wildcats! "Amazing staff that is so compassionate. You guys saved my Tootsie Roll!!" "Love Dr. Julie and Stephen. both are so great and enthusiastic with the animals! Everyone there is so good and I really appreciate the staff." "Love, Love, Love these guys! I wouldn't take my pets anywhere else!" "Thoughtful and caring staff - couldn't have been a better experience." "I truly believe Ina Rd. Animal Hospital is a great place. I do not believe the care of Lola and KoKo could be improved. A caring, kind, and loving staff as well." "We trusted Dr Devey with our first Dog Charlie . She always provided Excellent Vet. Care. Now, we take KD to Dr. Devey and your Staff expecting the very Best care. Thank you for providing our pets with the Best Vet. Care." "My dogs have never come back happy before. Love that you take the time to love on them while taking care of them."